Having grown up with a general contractor for a Dad I spent hours and hours with him down in his shop, or at house sites, or fixin' something around the house. I learned all I know from him and I am so happy he took the time to teach me 'tool things' when I was little. Because of him I was the girl moving into college my Freshman year with my own little tool box. When I moved into my first apartment my roommates came to me for a hammer, nails and a pair of pliers. When Christmastime comes around there are always a few tools to add to my collection on my list. Needless to say my collection is slowly outgrowing my current tool box. You know how some people have office closets or nursery closets? Well, I dream about a workshop closet. Living in an apartment, that's what it has come down to these days. But, oh would it be an awesome workshop closet. 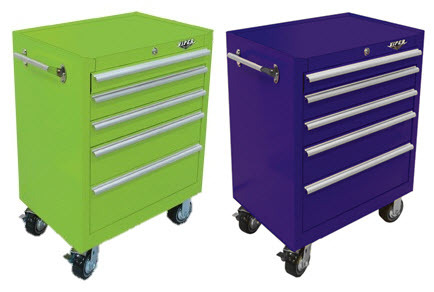 My pride and joy would be a hot pink tool chest. Yup, pink! How fun would this be to see in my workshop closet?? Just thinking of all the tools I could organize in those drawers makes my mouth water. Is that weird? Never mind, Don't answer that. Don't like pink as much as I do? Don't worry they have lime and purple too. I sound like a late night infomercial. But I am not being paid to say this, nor did I receive a free pink tool box to review. This is just my opinion. OMG, I can't decide if I love it, or feel a bit insulted? If I get one that color my husband would never go into it and grab a tool. What am I saying, he never does anyway. If pink puts your heart into power drive, go for it. I pack the tools in this house. The joke is he pays for them and I use them. Which, of course, is no joke at all. BTW my new kitchen island will be a gang of 4 Gladiator whirlpool tool boxes. This is not weird at all. 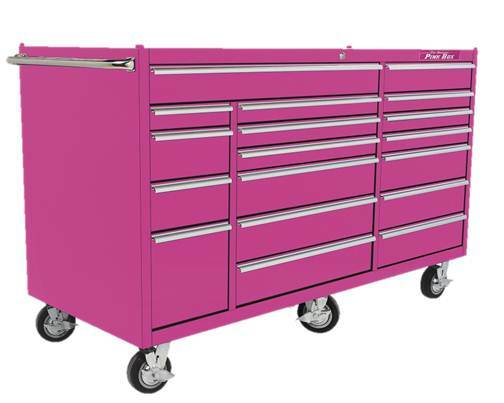 I dream all the time about having a pink tool chest that I can roll out of my closet. I too live in an apartment. I use my saw and my sander on my deck and my entry way closet is filled with tools and paint. I love it! cool! Wish I had that! 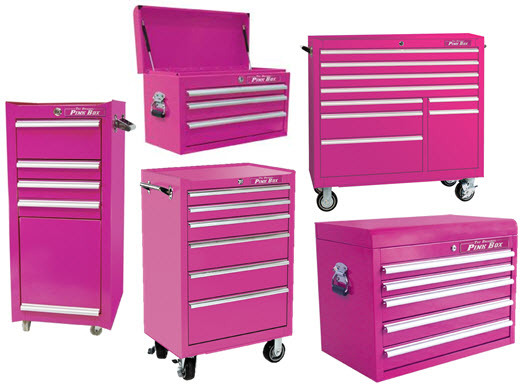 I could totally get on board with a pink tool chest just for me! Such fun! Those are adorable! I use a rusty ole toolbox that belonged to my grandfather-maybe it just needs a coat of new paint-thanks for the inspiration!! These are stellar. I use an old tool chest to actually hold all of my jewelry -- the shallow drawers are perfect for laying necklaces flat! Those are so much fun!! Love that--totally want the pink one.